Everyone knows or has at least heard of YouTube. If not, YouTube is the most popular video hosting website today and has been running since 2005. After YouTube being launched just for over a year, it was already one of the fastest growing websites on the Internet and that attracted Google to purchase YouTube for a whopping US$1.65 billion! The exact amount of videos hosted on YouTube is unknown but it is estimated that 300 hours of videos being uploaded to YouTube every minute so you can practically find videos related to any topics. If you have a video to share, uploading videos to YouTube might be the best option but will require signing in with a Google account which can be registered for free. After logging in to YouTube, click at the Upload button, select the privacy option whether you want the uploaded video to be public, unlisted or private, then you can browse for the video file to upload. 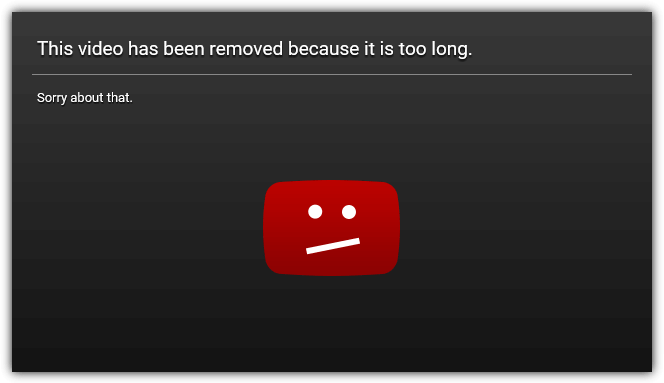 If you see the following dreaded message saying “This video has been removed because it is too long. Sorry about that” after uploading the video to YouTube, it is because the uploaded video file exceeded the video length limit. This video length limit in YouTube only applies to unverified users to prevent spam. As you know anyone can sign up for a free Google account which makes you a registered user, but to be a verified user, you’ll need to go through an additional step via automated phone verification. 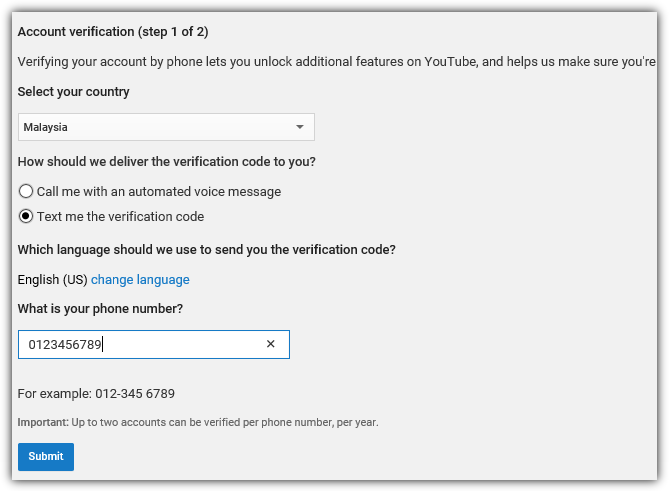 After completing the automated phone verification, your Google account status in YouTube will be upgraded to verified and that automatically removes the 15 minutes video length limit. Here we will show you the detailed steps on how to verify your YouTube account and reactivate the rejected video because the length of the video is too long without possibly spending hours to re-upload the same video again. Note: If you’ve finished uploading the video to YouTube but the progress seems to be stuck at processing your video, you can visit the Video Manager area and check if the video is listed on the page. If your YouTube account is unverified, you should see a red warning icon with the message “Rejected (length of video is too long)” for the uploaded video that exceeds the 15 minutes length limit. To enable the video, you’ll need to perform a verification step by clicking the “Verify account” button. If the “Verify account” button doesn’t work, you can directly visit this URL https://www.youtube.com/verify to get to the next step. The first step is to select the country that you’re currently in if the pre-selected option is incorrect. Then you have the option of either receiving a 6 digit code via SMS or a phone call with an automated voice message if your phone is unable to receive text messages. Finally enter your phone number without the country code and click the Submit button. If you’ve filled up the first part of the form correctly, you should get to step 2 of 2 to enter the 6 digit verification code. Enter the code that you received on your phone and click the Submit button. Entering the correct 6 digit verification code will automatically upgrade your YouTube account status to verified. You should see the message “Congratulations! Your YouTube account is now verified“. Click the Continue button to proceed. Do take note that the videos that you’ve previously uploaded before going through the verification process are still not viewable. The good news is they are not deleted or removed, but just require one more quick step to reactivate the uploaded videos. You need to go back to Video Manager and click at the “Activate this video” button. If the “Activate this video” button doesn’t work, you can visit this URL https://www.youtube.com/edit?action_reinstate=1 to reinstate the deactivated video. You should now see the message saying “The video was successfully activated” at the top of the page where you can edit the details of the uploaded video. If you’re uncomfortable in verifying your YouTube account by providing your phone number, then you can try other video hosting alternative sites such as Vimeo that is also free and does not have any limitation on the video length. A free basic Vimeo membership account allows your video to be hosted for free but has a limitation of 500MB upload quota per week. Today you can upload much longer videos in excess of 8 hours. I just uploaded a 17+hour video but it was rejected due to length. Account verified but it doesn’t matter since there is no time length limit mentioned in any of the faq sections of youtube stay for the upload size of 128gb. Note that once your video is uploaded the notification will still appear on you Android phone. So I had the uploaded video and then again it appeared as it did before verification. In an effort to remove the notification I clicked on cancel upload. Doing this deleted the activated, uploaded version of the video that had already been uploaded. It’s gone. Thanks YouTube. Youtube partners have an unlimited video length and file size (the limit is 20GB though if Firefox isn’t up to date, IE doesn’t have silverlight installed or Chrome doesn’t have gears installed). Youtube had a limit of 10-minute videos earlier. It was recently increased upto 15 minutes, but not many people know about this. 1) YouTube is probably the most reliable video service, because it is owned by Google and because it’s the largest. 2) You Can Ads to your videos. 3) YouTube is and may will be the most popular thus you will get the most exposure out of it. And about the limitation, yes, it is annoying, but not such a big problem. You can make your videos faster or slice them into parts. Also, you can try and remove unnecessary parts. If that won’t help you can as Gregg said chop your videos to parts. Really I’m as a watcher doesn’t care so much if the video I see is 1 part or 2 as long as it worth it. Wow! I didn’t know that, thanks for sharing us your experience! YouTube’s 10-minute limit (at least for regular, free/non-paying consumer accounts) is well-known, and has been YouTube policy for a long time. I’m sorry you didn’t know about it. Non-profit organizations, some businesses, and certain others can get longer limits. But for regular, non-paying consumer accounts, ten (10) minutes has long been the limit. Some time back, the 10-minute limit was extended to 15 minutes, but it later returned to 10 minutes. However, by chopping a long video into 10-minute-or-less pieces, and then arranging them into a “playlist,” YouTube will play the first piece, then, automatically, play the second, etc. So, by hook or by crook, it’s still kinda’ possible to put longer videos on YouTube. Whe a 15 minute video worked for you, I don’t know. If it was a while back, during the time when YouTube temporarily extended the time limit to 15 minutes, then that might explain it. And, of course, there’s always a possibility of a simple technological glitch which allowed the longer video to stay. Who knows. But it’s definitely 10 mins, period. Just about the only way around it… er… well… you know… SORT of… is the “playlist” thing.